Isn’t this Gold-striped Screw Pine captivating? A very striking variegated beauty with long, golden and green strap-like leaves spiralling from a branching trunk. Best of all, its beautiful foliage is without spines along the margins! 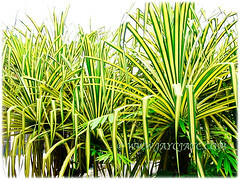 This plant is unlike the fragrant Pandanus amaryllifolius (Pandan Leaf) that is popularly used for culinary purposes. 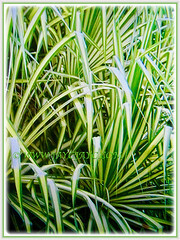 Botanical Name: Pandanus baptistii ‘Variegated’ (Syn. 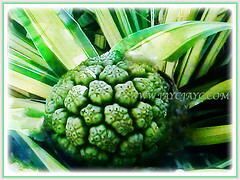 : Variegated Pandanus Sanderi, Pandanus tectorius ‘Sanderi’). 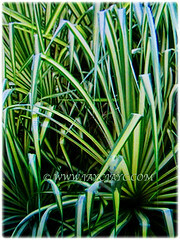 Common Names: Gold-striped Screw Pine, Variegated Screw Pine, Compact Golden Screw Pine. 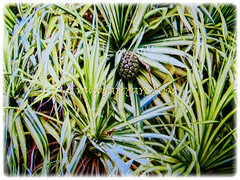 Origin: Pandanus baptistii is native to Madagascar, Mauritius and the Seychelles whilst Pandanus baptistii ‘Variegated’ is a cultivar. It is also cultivated elsewhere around the world. Plant type: An ornamental, perennial and tropical shrub. 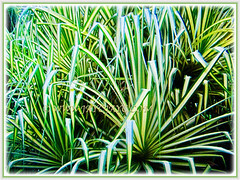 Features: Pandanus baptistii ‘Variegated’ is one of the many species in the genus, Pandanus which consists of about 750 accepted species. A fast-growing large shrub that will eventually develop a stout trunk and reaches up to about 2 m in height. It has many thick stilt roots near the base which provide support as the plant grows top-heavy with leaves, fruit and branches. This variegated beauty has showy leaves with a broad golden-yellow stripe down the leaf center and sandwiched between the green margins. Leaves are spirally arranged that arch gracefully and taper to a long point. Foliage is spineless along the margins of the leaves and not fragrant. Besides, it also produces fruits amidst its variegated foliage. 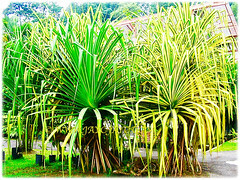 Culture (Care): Pandanus baptistii ‘Variegated’ or Gold-striped Screw Pine grows easily with least maintenance. Moisture: Moderate water requirement. Water regularly as it needs constantly moist soils. Can be drought tolerant when well established. Soil: Humus-enriched, loamy and well-drained soil. Others: Remove withered leaves to keep the plants tidy and aesthetically pleasing. Feed once fortnightly or monthly with a balanced liquid foliage fertiliser for optimum plant growth and foliage variegation. Generally, free from serious pests or diseases though do watch out for mealybugs, aphids and mites. 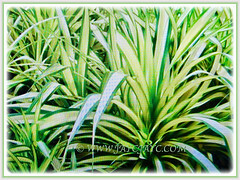 Pandanus baptistii ‘Variegated’ or Gold-striped Screw Pine is a hardy plant, being both drought and salt tolerant. An eye-catchy perennial in hardy regions. It is not frost tolerant and must be grown in a frost-free environment. Grow in a pot to control its enormous size so that it can be a houseplant and brought indoor easily to overwinter in a bright area, providing as much light as possible. In winter, do not expose it to cold drafts or temps below 12.78°C. Water regularly during the growing season in summer but reduce gradually during winter. Feed once fortnightly with a balanced foliage fertiliser from spring to summer but once monthly in winter. Propagation: By removing the plantlets that emerge from the base of established plants. 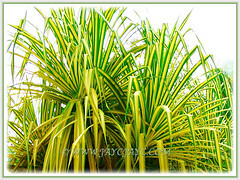 Usage: Pandanus baptistii ‘Variegated’ or Gold-striped Screw Pine with its captivating variegated foliage will be excellent for very large gardens. 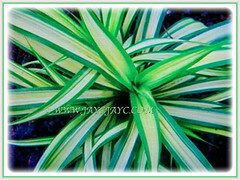 An ornamental spine-free foliage that is often used in flower arrangements. This plant can be grown outdoors in the garden as a feature or specimen plant but will need room to accommodate its sprawling habit.